Hey these are the spells, i know alot of people don't believe in the spells and think that with only shifting it will work, no that's not true? ''Well, do you know mermaids who became mermaid by a spell?'' 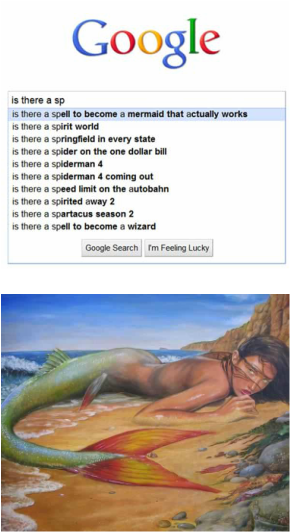 NO, But i believe, and many others that you can become a mermaid by a spell. Yes, shifting does work. So check out these spells and try to find one you're interested in. All these spells are coming from different websites, i didn't make them myself. Alot of people said that these work and that they're having side affects. Make me what i wish to be ... A MERMAID ! Give this power to me ! The spell: A human when dry, a mermaid when wet, and have a power like() and have a tail the color of() a human when dry, a mermaid when wet, gills are not needed, just a big breath, that lasts 30 minutes, a human when dry, a mermaid when wet, i’ll get my powers, and tail in 1 week,i’ll get my tail, one minute after being wet, when wet a human when dry, a mermaid when wet, the rain does not matter, it cannot change me, but a drop of any other water will. You get to choose your power(heating, freezing, molding, psychic, telekineses,ext.) And your tail color. After completing the spell, sit in the tub, and your heart should reveal what to do next. Listen to it, mine told me to go under, and to sit, if you do not hear anything, or feel anything, then get out QUICKLY it takes a week, i think, i’ pretty sure. And for those who do not belive me, go ahead, don’t belive, but I know i’m not lying,and my true friends here on think so as well. As I will it, so.